Kodak has done well with the M550, which actually performs better than the more expensive M575. This unit offers great performance and great image quality for a camera that costs only $150 US or less. Read more in our Full Conclusion. 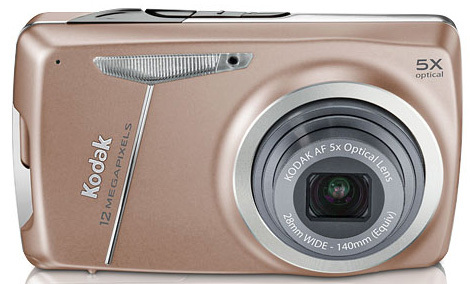 For those who want a simple to use digital camera, Kodak has developed the EasyShare M550. A simplified version of the M575, the M550 boasts some useful features that will help you capture pleasing snapshots. These include 12-megapixels of resolution, a wide 5x optical zoom lens, Blur Reduction technology, a 2.7-inch LCD, Face Detection and Face Recognition technologies, and their Smart Capture exposure mode. The Kodak EasyShare M550 is available now with a MSRP of US $149.95 US.